In a food processor, combine flour and salt. Add the slightly beaten egg, and mix by pulsing for less than a minute. Mixture should form a stiff dough. On a lightly floured surface, knead dough for about 3 to 4 minutes. Wrap with plastic wrap until ready to use. Divide roll into 6 pieces (cut with a knife or pastry cutter) Using a rolling pin flatten it out. Set pasta machine in number #7 setting and pass it through. Use knife to cut into strips of desired width. 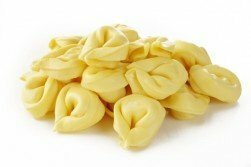 Shaping round tortellini: Cut the sheet into rounds using a 3″ round cutter, spacing the rounds as close together as possible. Gather the scraps into a ball and put them with the remaining pieces of dough to re-roll later. Place 1 teaspoon of filling in the middle of each round of pasta. Dip your finger in the bowl of water and run it along the edge of the round to moisten. Fold the dough over to form a half-moon, then draw the two corners together to form a rounded bonnet-shape. Press tightly to seal. Toss with flour, set aside on well-floured baking sheet, and cover. Repeat with remaining pieces of dough, re-rolling the scraps.